A few weeks ago I got a package in the mail. It had some cute stationary in it and I didn't look at it too closely because, well, I've had a few other things going on in my life lately! But I need to tell you about this cool stationary from Paper Culture and their awesome commitment to community and the environment. The thing that impresses me the most is that all their cards and envelopes are printed on 100% post-consumer recycled paper. They also donate a portion of all proceeds to community causes although they don't say which ones or how much they donate. 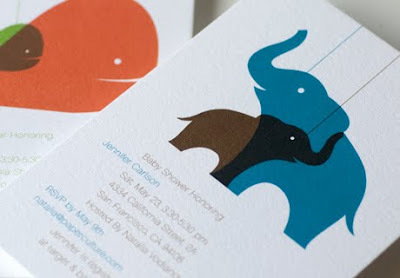 I received a sample of their announcement/invitation set as well as a sample of their personal stationary. I was impressed with the quality and thickness of the paper although I have to say I was a bit surprised that the personal stationary is still just one flat paper rather than a folded notecard. It would be great for a quick note, but not much more. 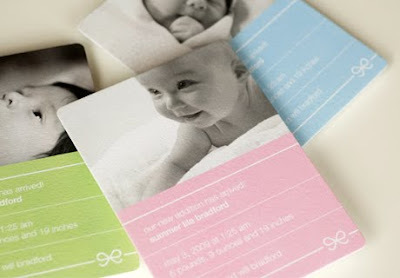 Currently they only have invitations (for all types of things) and announcements on their website, but they sent me some blank cards (personal stationary) as well as a thank you card. You can order any of the current designs as thank you cards or blank and they will be adding those categories to their website soon. 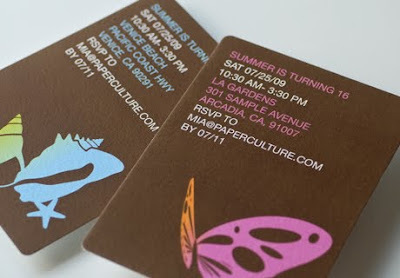 Finally, Paper Culture has a mail and message program where for only the cost of the card and postage (through January 1, 2010) they will print individualized messages for you, stamp, address, and mail your cards. Once again, if I had a new baby I would totally use this service! For more than 30 cards they will send you a template and then upload all your addresses for you so you don't have to type them all in by hand (less than 30 cards is a $10 fee). I really like the options and the service Paper Culture provides. Their prices are reasonable and they're being good stewards of the earth! You should check them out! Discount: Through September 30th place a $75 or more order and receive $15 off! No code needed.